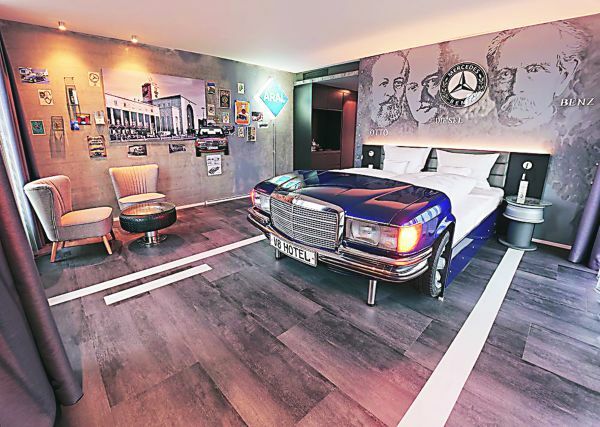 The new V8 Hotel in Motorworld region Stuttgart opened earlier this year, to give a unique hotel stay to car lovers along with the existing V8 Hotel Classic. What’s unique about V8 hospitality experience are the Car Themed Rooms which are a great attraction to guests of all age groups. Pointing out Stuttgart is the birth place of the automobile, Simeon Schad, hotel manager, V8 Hotel, said, “Our highlights are the Themed Rooms. Our guest can sleep in different cars in a unique atmosphere like a petrol station, race room, garage or car cinema. We offer 26 of these rooms.” The Mercedes Suite is also designed as a themed room. Covering four floors, the personal personal rooftop terrace in this suite gives an expansive view of Motorworld. V10 Service Apartments are for long stay guests. The Design Rooms have historical cars on wallpapers and showcase a special design. According to Schad, a stay at the hotel will be of much interest to Indian travellers as they can enjoy an authentic experience of the world of automobiles. Guests staying at V8 Hotel can visit the Mercedes Benz-Museum/factory, Porsche Museum. “In our hotel, guests are surrounded by more than 300 historic and sports cars. The Motorworld is 24,000 meter square – the biggest lobby in Europe,” stated Schad, adding that interest about cars comes from many countries, in particular from Asia and Europe. Families staying at the hotel can opt for interconnected rooms. “Especially for families we can offer more than 30 rooms. Some of them with connecting doors and some of them are big enough for five people. We have 187 rooms so it is good for groups / extended families. We also have excellent facilities for MICE and are also a great venue for weddings,” remarked Schad. The Motorworld offers 14 different Congressrooms for MICE – from six delegates to 600 people. There are nine different car brands are in the Motorworld showroom and garage – Rolls Royce, Ferrari, Maserati, Lamborghini, Bentley, Lotus, McLaren, Porsche and about 200 historical cars.